We all deserve to get-away from the “hustle and bustle” of everyday life. All work and no play leads to a dull life; therefore re-energize yourself!!! The W-HOTS team will create a lifetime of memories beyond your wildest dreams. We will make it easy for you; all you need to do is relax, sit back, and leave all the planning to us; low deposits, affordable, easy payment plans, and all the fun you can possibly imagine. You have so much to look forward to when traveling with the W-HOTS Travel Group… FUN and more Fun!!! 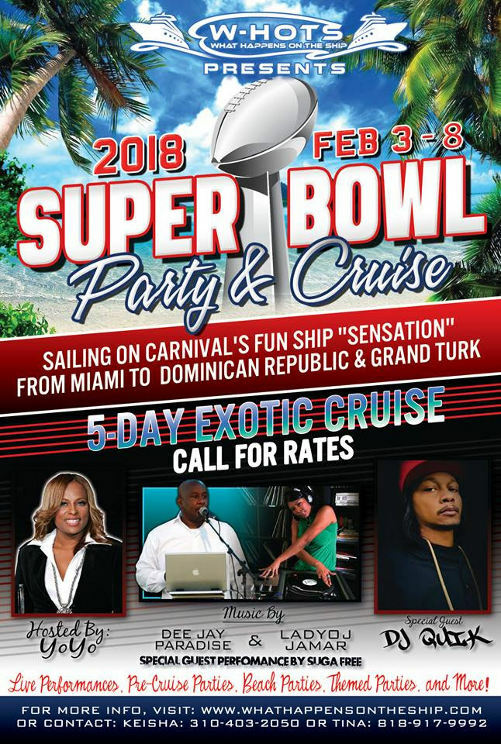 We have organized group vacations such as the popular Super Bowl Cruise. We also offer roommate suggestions at no additional cost for those that would rather not travel alone but just can’t find anyone to accompany them. Our average traveler age range from the early 30s to the mid 50s, however, we do get the young at heart 60+ year olds as well. Don’t let this scare you because every age group is welcome so whether you are 25, 55 or anywhere in between or beyond, you will enjoy the camaraderie, fun and safe traveling with the W-HOTS Travel and Entertainment Group. We guarantee you will have an amazing vacation experience while exploring the amazing sites, cultures, and beauty of the world with all of your great friends and loved ones; both old and new. 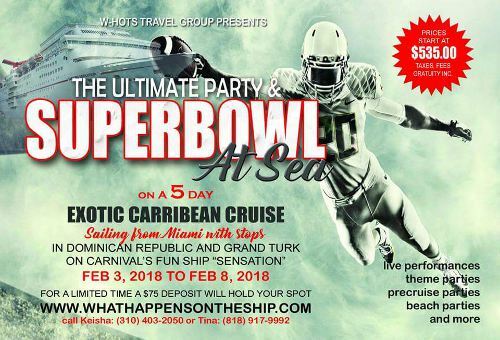 What Exactly Is The Super Bowl Cruise? The Super Bowl is not just about a game, it is about a party. What better way to gather friends and complete strangers and party at sea for 5 days non stop.